It's not surprising that AMD has a fight on its hands. Intel continues to dominate the high-end processor market with its Core i7 chips, forcing AMD to all but focus its efforts on mainstream $100-150 processors. Then just when AMD seemed to be 'safe', Intel began making inroads with its "Clarkdale" Core i3 and Core i5 CPUs into that segment as well. For the moment AMD is keeping ahead on the price/performance front while Core i3 and Core i5 CPUs suffer from an overly complex platform topology. Enter the AMD Athlon II X4 635 processor, a mainstream quad-core chip clocked at 2.9GHz and priced at just $120 bucks. Compatible with socket AM3 and AM2+ motherboards, the AMD Athlon II X4 635 is set to be the darling of media PC, home FTP server and budget-minded home PC builders. Architecturally speaking, the Athlon II X4 635 processor is identical to the AMD's AII X4 620 chip that PCSTATS tested a few months back, it's just clocked 300MHz faster. If you're familiar with that processor you know that quad-core Athlon II X4 processors are ideal for media PC applications when paired with AMD 785G (or upcoming AMD 800-series) motherboard. Put head to head against an Intel Core i5 or AMD Phenom II X4 processor they will bring up the rear, but if you're in need of a good all-around home computer on the tight budget it's good value for the money. I know we often get fixated on expensive enthusiast grade PC technology, but if you can't afford that it's nice to know economical options do exist. AMD's socket AM3 Athlon II X4 635 chip features 512KB of L2 cache per core (total of 2MB), but unlike the Phenom II quad-core designs it has no L3 cache present. Platform compatibility is broad thanks to a DDR2/DDR3 memory controller which makes it possible to install this processor on motherboards that support DDR2-1066 or DDR3-1333 memory. For PCSTATS review platform we've selected the Gigabyte GA-MA790FXT-UD5P mobo and 4GB of Corsair XMS3-1600C9 DDR3 RAM. If you're building a new PC from scratch, it's wise to go the DDR3-route. Manufactured on a 45nm SOI process at the Global Foundries Fab 1 module in Dresden Germany, the Athlon II X4 635 has a die size of 169mm2 and contains 300 million transistors. Although it's some 300MHz faster than the similar 620 CPU, the Athlon II X4 635 maintains the same Thermal Design Power (TDP) of 95W. AMD's Athlon II X4 635 is natively a socket AM3 processor, it is also backwards compatible with socket AM2+ motherboards. It's this backwards compatibility that continues to make the AMD platform very cost effective and easily upgraded. Right now it's best paired with the AMD 785G chipset, but very shortly it can be paired with AMD's 880G and 890G chipsets. As you might expect, the 2.9GHz Athlon II X4 635 processor supports full hardware virtualization, so individual cores can be assigned to virtual machines. Built in virtualization is one of the big features of Microsoft Windows 7, and it is this that makes running Windows XP Mode inside of the Windows 7 operating system possible. The Athlon II is also moves C1E low power states out of the BIOS and onto the CPU hardware. Retailing for around$125 CDN ($120 USD, £75 GBP), the Athlon II X4 635 processor is one of the most affordable quad-core CPUs on the market. Its primary competition will be coming from AMD's own Phenom II X3 processors and Intel's Core i3 and Core i5 processors. Let's see how this faster Athlon II compares in the very competitive mainstream processor field. AMD's quad-core Athlon II X4 635 CPU is built on the 45nm "Propus" die, essentially a slimmed-down version of the 45nm "Deneb" core that's been around since first Phenom II processor. 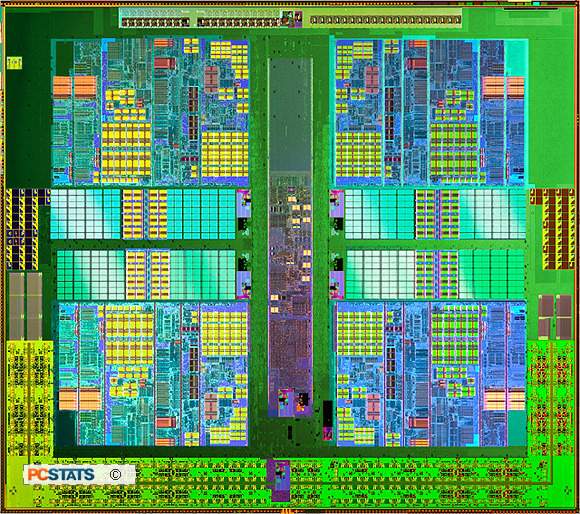 AMD's 'Propus' core consists of four individual computational cores (4-core, 4-thread) with 512KB of L2 cache each, but unlike "Deneb" this chip contains no L3 cache. Consequently the AII X4 635 die is slightly smaller (169mm2)and a contains a little more than half the number of transistors, ~300 million. This is the Athlon II X4 635 "Propus" die. The L3 cache has been removed, cutting down die size and reducing the processors power requirements and heat output. Having no L3 cache has a few consequences for the Athlon II X4 635 processor. A large, fast L3 cache is important for communication between processor cores and multi-threading efficiency after all. When all four cores are busy processing threads the L3 cache acts as a pool that feeds the individual L2 caches. Ultimately this reduces the frequency that the processor has to fetch information from system memory (system memory) or virtual memory (hard drive), both of which are orders of magnitude slower than accessing quick on-die L3 cache. In applications that rely on streaming a lot of data into all four cores from memory, the lack of L3 cache hurts the AMD Athlon II X4 635 processor's performance. Moving on, the power meter is hooked up and ready to measure, so let's take a look at how much juice a PC system built with a quad-core Athlon II processor actually draws. Even with a couple hundred extra MHz under the hood, the Athlon II X4 635 CPU idles at 127 Watts, a hair lower than the Athlon II X4 620.